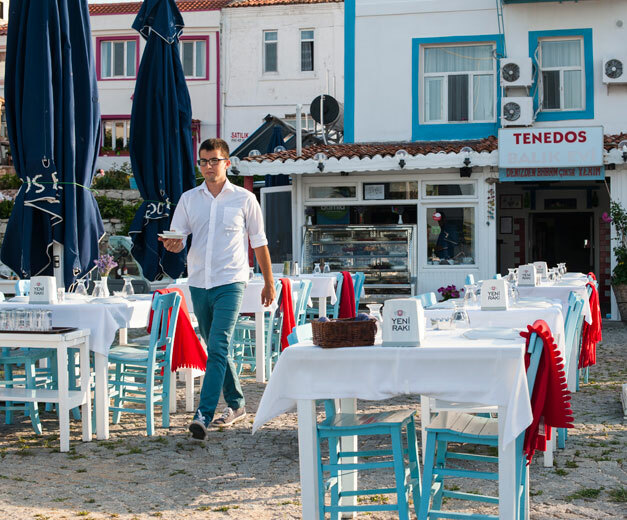 On the western coast of Turkey, the town of Alaçatı sways to the light of a thousand glowing cafés. 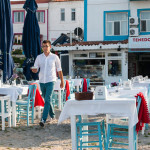 What was once a typically beautiful and sleepy Turkish fishing village has transformed into a hub for glitzy nightlife. People swarm the seaside walkways to see and be seen, arriving in metallic SUVs and humming Italian land rockets. Throngs of bejeweled summer vacationers stream through picture-book cobbled streets and whitewashed roads, but if you can break through the crowds, a fantastic meal awaits. Babushka Restaurant offers the opposite of what Alaçatı is known for: homey seclusion. 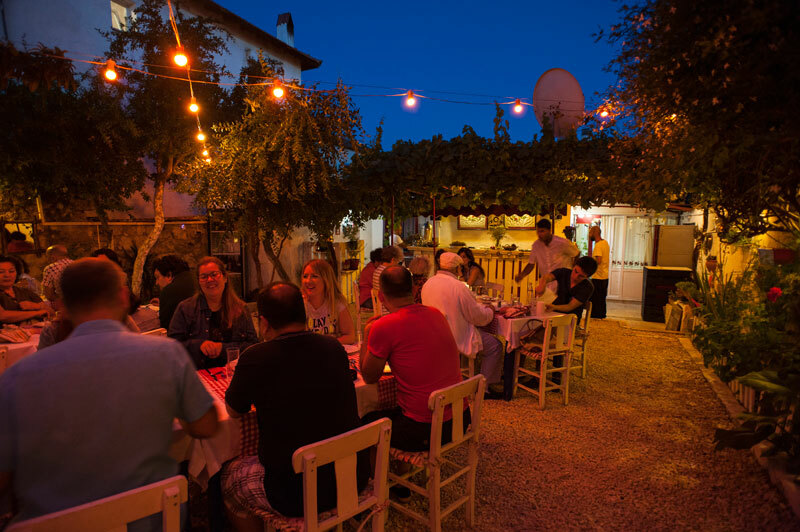 Nestled in the walled garden of the chef’s home, restaurant goers are transported away from the hum of Alaçatı to the peace of their grandmother’s backyard. When we visited recently, Olga Irez swept through the kitchen with a mixing bowl, finding a place at the kitchen counter where she could finish the preparations for that week’s dessert. After careful planning she had decided to make tahinli nevzine for dessert, a succulent cake of tahini and walnuts. She easily bantered in Turkish and English, piloting her staff in a space no larger than the kitchen in a typical home. Everything started with her grandmother, whose cooking first fostered Irez’s passion when she was a child. Irez grew up in Russia and worked there and in Ukraine as a strategy consultant until she was consumed by her passion for food. In 2010, she visited Istanbul for the first time and decided she was ready for a drastic change. Later, she found new inspiration in her mother-in-law, Zeliha Irez. Family is central to Babushka, which was named for her and her husband’s grandmothers, the inspirations for both of them to pursue a life devoted to food. 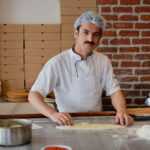 Özgür, Irez’s husband, can be seen behind the bar or helping to organize the front of the house. 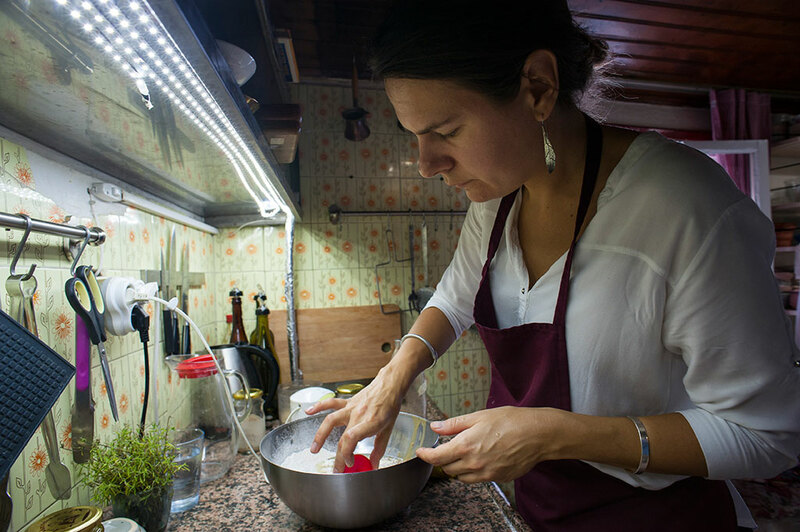 Apart from taking cooking classes around the world, Irez spends time studying and working under Zeliha in Sapanca, where her mother-in-law has a special culinary resort. Irez says she is constantly learning and growing, honing the skills passed on to her from Zeliha. 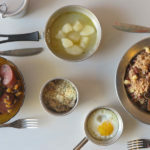 We first discovered Irez via social media; she publishes the blog “Delicious Istanbul.” Before moving to Alaçatı, she lived and worked in Istanbul’s Kadıköy neighborhood, teaching cooking classes and guiding culinary tours. Irez’s prolific online presence is her way of solidifying her knowledge. “We blog and do posts to document my learning process. I learn something and so I share,” says Irez. Offering up recipes and advice reaffirms her understanding of a particular technique or preparation, thus building confidence – and also allowing her to share information she believes important to pass on. Not only is the restaurant her home, but the presence of Irez’s family makes Babushka both cozy and intimate. In what used to be a small, homey dining room, squash blossoms surrounded Irez’s mother-in-law. She deftly cleaned and gently stuffed the yellow flowers with cheese and herbs as one of the evening’s mezes. The menus change constantly at Babushka. Irez’s core belief is that seasonality and availability should guide the meal. “Some things are really easy to get, some things we struggle with,” she said. “Like sardines – every day we chase, we have three fishmongers we work with for sardines, and you never know which one is going to have it.” If something is not fresh, it is not served. At the same time, the rotating mezes are crafted to complement each other, combining flavors that do not necessarily traditionally go together to create a unique, yet familiar experience. 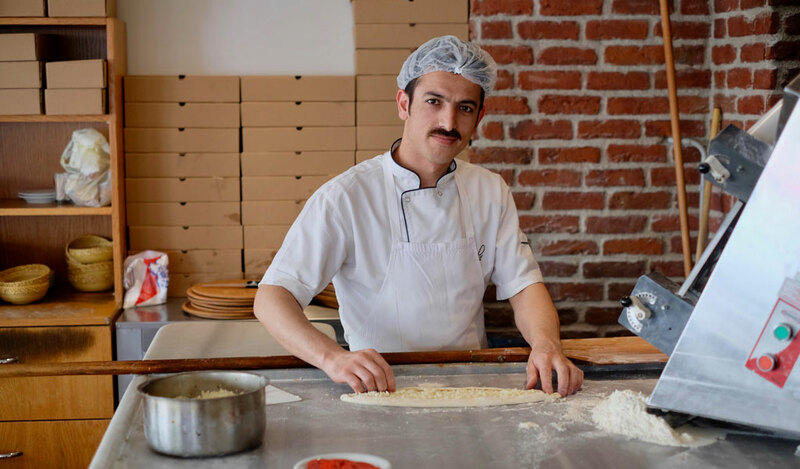 Irez thrives when trying new things that break the traditional meze mold. Deniz börülcesi, or the sea vegetable samphire, is commonly paired with fish in the Aegean. Irez decided to combine it with purslane and told us, “A lot of people told me it was a great idea but they wondered why they had never seen them anywhere else. So for one thing, at the market when you go they are sold next to each other. If the stall carries deniz börülcesi then they will carry the purslane as well. Why not put it on the same plate?” The combination is remarkable and simple. 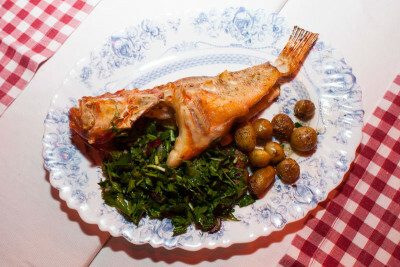 The first bite brings the salty and lemony flavors of the samphire and an herby and bitter tinge from the purslane that is addictive. When dishes arrived at the table, they disappeared as quickly as they had come. The flavors were familiar to those experienced when eating Turkish food, but with subtle differences. A few Russian dishes, like draniki (potato pancakes with dill) and pelmeni (dumplings), also appeared on the menu. The fresh-baked bread was a wonderful touch, still smelling of the oven when it arrived at the table. Scorpion fish was the crowning entrée of the night, eaten whole as the tender meat fell off the bones. It’s no wonder people stay for hours, sipping wine into the night under the red glow of lights hung amongst the vines. 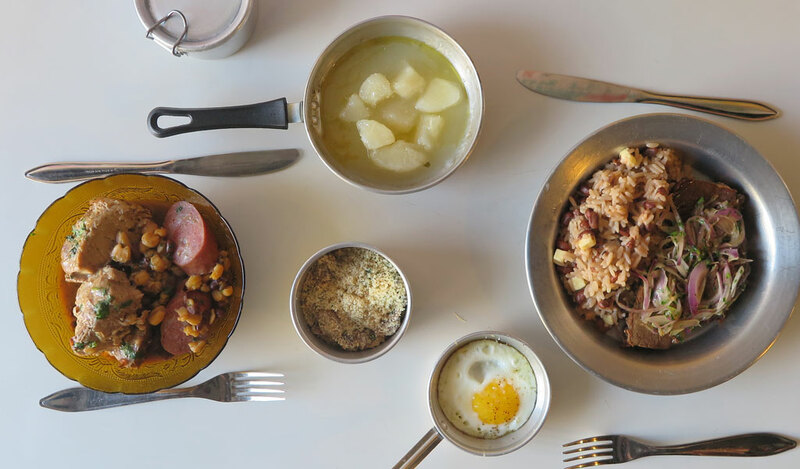 Babushka is a remarkable place that successfully blends old-fashioned cooking with new ideas and a passion for experimentation. For those who want to make these dishes at home, Irez offers cooking lessons on the weekends, and she offers weekly recipe updates on her blog as well.